In 1942 the US Armed Forces stationed in the Philippines on the islands of Corregidor and Bataan were subjected to one of the most brutal Japanese offensives of the war in their attempt to capture both American strongholds. Both islands were eventually lost as the beleaguered troops surrendered, many of whom endured the horror of the Bataan death march. Through newsreels and newspaper reports the American people learned of the military nurses who fought valiantly to offer aid and comfort to the endless stream of casualties on a 24/7 basis. Tending to the injured and dying under the hellish circumstances of constant bombardment and artillery fire was a monumental effort carried out by ordinary women performing their duties as they had been trained, in an environment unlike any other they had experienced. In their unyielding determination to leave no one behind many of them were captured by the Japanese, ending up on the infamous death march or in POW camps. Hollywood felt that the exploits of these courageous women needed to be documented on film. Two studios, Paramount and MGM, each produced their own version of the same events surrounding the fall of Bataan, both released in 1943, So Proudly We Hail and Cry Havoc. 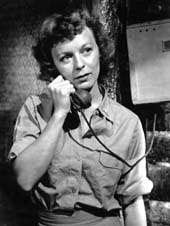 Each film boasted a strong female cast playing nurses and civilian volunteers; glamorous and popular stars appearing ragged and filthy in the mud and blood of the Pacific war zone. This was an attempt to attain the most realistic depiction of the actual conditions, but a reality tempered by the decisions of the Office of War Information, the government agency which had the power to accept or reject any proposed elements in all films about the war. nomination for its special effects a well-deserved nod to the exceptional recreation of the devastating siege of Bataan. The response from both critics and public was positive; the esteemed critic for the New York Times, Bosley Crowther, declaring it "a shattering impression of the tragedy of Bataan." 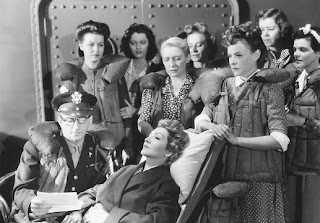 Taken in context the film was a superior example of Hollywood populist propaganda directed at convincing the American public that this was indeed their war; the audience felt they were getting an honest recreation of the hardships endured by the Red Cross nurses who had exhibited an untapped reserve of courage under fire. 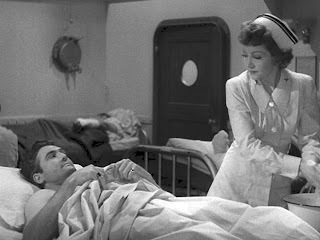 Later critics pointed out that the film's emphasis on the romantic plot lines detracted from the depiction of the nurses responses to the daily crises and threats that had defined their heroism. This film was one of Paramount's biggest releases of the year and received four Academy Award nominations, including one for Best Supporting Actress for Paulette Goddard. 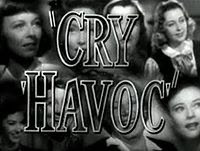 Cry Havoc, MGM's version of the Bataan evacuation, also released in 1943, was based on the play Proof through the Night by Allan Kenward, which had a successful run in Los Angeles, but failed to attract audiences on Broadway. It told the story of a group of nurses and civilian volunteers trapped in a bunker waiting for the imminent Japanese attack. The all-female cast included well-known actresses Margaret Sullavan, Joan Blondell, Ann Sothern, and Fay Bainter; the remaining roles were played by up-and-coming talented performers Marsha Hunt, Ella Raines, Frances Gifford, Diana Lewis, and Heather Angel. There were men in the film but they appeared only briefly and had no dialogue; the emphasis remained on the women. 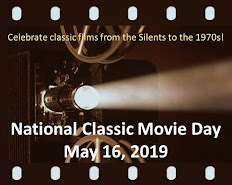 Unlike the ethnic mix of soldiers present in most male-dominated war films, the characters here were a microcosm of America's social classes, from lowbrow to high society; a former burlesque queen, a Southern aristocrat, an aspiring writer, a switchboard operator, a factory worker. The film chronicles the relationships that develop among these diverse personalities, an often frustrating and demanding process. It is imperative that they eliminate the societal barriers which separate them in order to create an effective and cohesive unit. Eventually they do begin to reveal stories from their past which serve to dilute the suspicion and hostility which had hindered their training. Romantic entanglements are discussed, but there are no love scenes to undercut the realistic portrayal of the gritty and sometimes deadly nature of their situation. In the end they decide unanimously to stay on the island with the wounded and do not escape. The horror stories about Bataan were still fresh in the memories of Americans and they could relate to events depicted in the movie, thus making it a moneymaker for MGM. Although both films received critical praise and were popular with audiences, present-day critics have attributed this positive reaction to the unique women's perspective of the battlefield and the public's belief that they were witnessing an authentic rendering of conditions surrounding the battle of the Philippines. 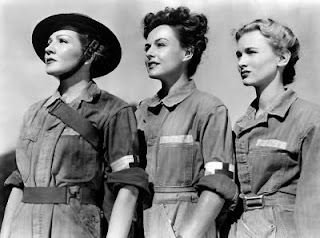 At a time when the country was still reeling from the devastating loss of Corregidor and Bataan and winning the war was no longer a certainty, a film honoring the sacrifices of a brave band of Red Cross nurses provided some semblance of dignity amidst humiliation and offered Americans a chance to believe that the United States would prevail. Saz, I've not see Cry Havoc, but I really enjoyed So Proudly We Hail. Colbert, Goddard and Lake are all very good in this picture. A lot of people tend to only remember the atrocities committed by the Nazis, but this film is an excellent testament to just how diabolical the Japanese were in their treatment of POWs. In reality, some of the things the Japanese did were just sickening. The real truth of what happened to some of the nurses left behind could not be told when these films were made. Unspeakable evils were carried out and are not really remembered as well as what the Nazis did in their concentration camps, but believe me, they were bad. One of the nurses came from a small (pop. 600) NE town called Verdigre. It would be interesting to know where the others cane from. Saz, this sounds like an incredible double-feature of two films (which I'm embarrassed to say) I've never seen. Although CRY HAVOC sounds like the more interesting of the two, I'm intrigued to see Veronica Lake in what sounds like a different role for her in SO PROUDLY WE HAIL. I appreciate your historical perspective of the two films and how they're viewed today. Well-done post. Outstanding article, Saz. Your explanations of the history behind the films and your reviews of the films themselves are just excellent. I love both films, and would be hard-pressed to choose the best. I can understand the feeling of a need for some personal romance storylines, considering the horror of what was going on, but I guess if pushed I would have to say I think that Cry Havok was No. 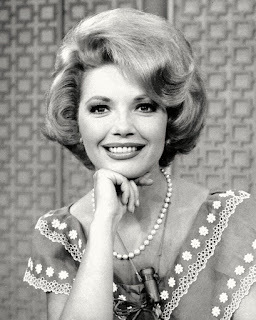 1, in large part because of Margaret Sullivan's wonderful performance. Thanks for the depth of your overview of these important films. Saz, I truly appreciate this post. These films truly remind us of the sacrifices women made in their service during wartime. I have never seen "Cry Havoc" but will have to look for it. Thank you for a very thought-provoking post at a time when we need to remember. Awesome job! Saz, Awesome!! review of one of my favorite movies, So Proudly We Hail. You may have already viewed the Video on youtube where Veronica Lake In keeping with Army regulation, changed her famous "peek-a-boo" hairstyle. She cut it, because women who copied her worked in factories kept getting their hair caught in the machinery. I will see if I can find the video and add to Noir and Chick Flicks page.. I have not seen the movie, Cry Havoc. I will add it to my "gotta see" list of films. 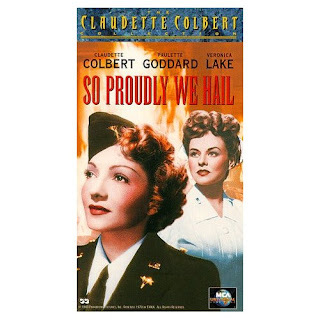 I am reading "Angels of Bataan" and have found the nurses involved truly hated the film "So Proudly We Hail". That movie was my first introduction to that era and the role nurses played. I'm certain I could not have been so brave nor determined. God bless them all!